Butler University’s delegation turned in a strong showing in its first appearance in the Model Arab League, held Feb. 21-23 at Miami University in Oxford, Ohio. Kirstie Dobbs, Delaney Barr, Needa Malik. 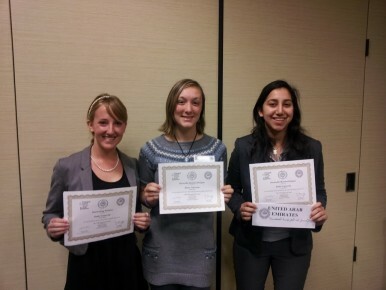 Individual honors for Butler include Delaney Barr (International Studies), who received Honorable Mention in Social Affairs; Needa Malik (International Studies), Honorable Mention in Joint Defense; and Kirstie Dobbs (International Studies and French), Best Delegate in Political Affairs. Through participation in the National Council on U.S.-Arab Relations’ Model Arab League (MAL) program students learn about the politics and history of the Arab world, and the arts of diplomacy and public speech. MAL helps prepare students to be knowledgeable, well-trained, and effective citizens as well as civic and public affairs leaders. Universities and high schools from across the United States are invited to participate. Robert L. Oprisko, visiting assistant professor in Butler’s International Studies Program, oversaw the Butler delegation and said it earned a reputation for innovative problem solving and mastery of parliamentary procedure. The Butler students were responsible for a number of firsts in Model Arab League history, including the first joint-session, the first use of the International Criminal Court, and the first use of protest to promote policy (in honor of the Arab Spring). The Butler delegates received high praise by other faculty-coaches including Vaughn Shannon (associate professor, Wright State), Saleh Yousef (provost and executive vice president of academic affairs, Miami of Ohio), and Ambassador Feisal Amin Rasoul al-Istrabadi (director of the Center for Middle Eastern Studies, Indiana University).